The Prairie Sunflower is a member of the Sunflower Family. The plant grows to 4 feet in height and has green lance shaped leaves to 2 inches in length. It can typically be found growing along roads and in fields at elevations between 1000 and 7500 feet. 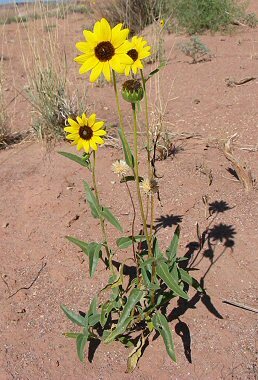 The Prairie Sunflower is also referred to as a narrowleaf sunflower or sand sunflower. The Prairie Sunflower blooms between April and October and produces a yellow rayed flower with a brown central disk.